Beautiful Views - Walk to Lift - Private Locker at Lift Base. This beautifully updated, two bedroom, two full bath condo in Vail Village is our second home. We have equipped and furnished it to be a true 'home-away-from-home.' It has a huge natural stone fireplace in the living room, king-sized bed in master bedroom, twins in second bedroom and a full-sized dining area. The unit is on the 4th floor of an elevator building. You will have an assigned covered parking space. NO smoking allowed. We think you will love the condo as much as we do. Ideally located midway between the Village Center and Lionshead, it is an easy walk to the Gondola One lift or the Eagle Bahn Gondola. We provide a private ski locker for your use at the base of Gondola One. The locker fits four pairs of skis and boots, and even has built-in boot dryers. They have a full line of ski rental equipment right at the locker site; as our guest, you can get a 20% discount on all rentals and 10% discount on ski tuning services. Additionally, you can receive a 10% discount on airport shuttle service from Colorado Mountain Express, if you book online. Visit our website for more information. My husband and I live in a suburb of Chicago. We are semi-retired and enjoy skiing, Hobie sailing, windsurfing, golfing and most outdoor activities. We enjoy Vail all year-round and try to get there as often as possible. After coming to Vail to ski for about 20 years, we decided to purchase a property in Vail Village. We wanted a location that was walking distance to lifts, shops and restaurants. In retrospect, this was one of the best decisions we've made. We remodeled the entire unit and added high-end touches like custom alderwood doors and oak floors. 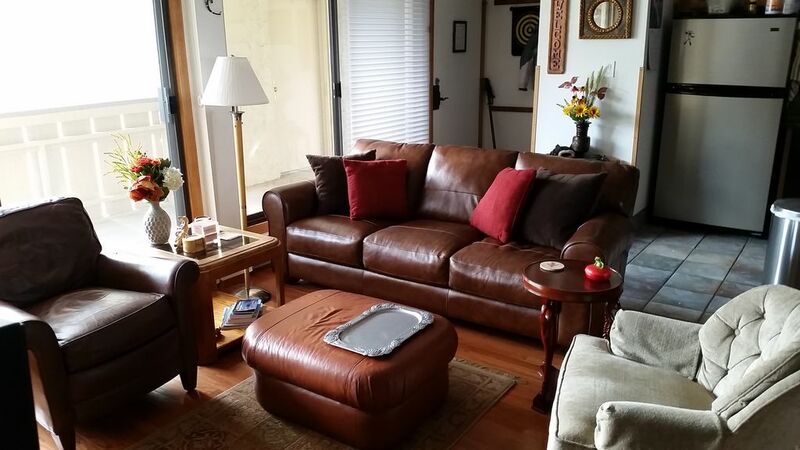 Our guests find it to be a very comfortable and tastefully decorated condo. Since we are located midway between the Village and Lionshead, both can be easily walked to. Since we do not like to walk in ski boots, we have a ski locker at the base of the Vista Bahn lift which our guests can use during their stay. The locker can store up to four pairs of skis and boots. toilet, combination tub/shower, Soaps, hair dryer, over-sized bath towels are provided. Over-sized bath towels; additional towels and sheets in linen closet in unit. 10-cup drip and K-cup coffee makers. Every utensil you might need. Fully stocked with spices, teas, coffee. Humidifiers, Hair Dryers, Complimentary Storage Locker at base of the Vista Bahn Lift (stores up to 4 pairs of skis and boots), discounts on ski rentals and airport shuttle. Farmer's Market in the summer months.